NASA interns and NASA astronauts have joined forces to create a very humorous and entertaining music video parody of the “Gangnam Style” mega hit by international pop sensation PSY – It’s called “NASA Johnson Style” and its New! 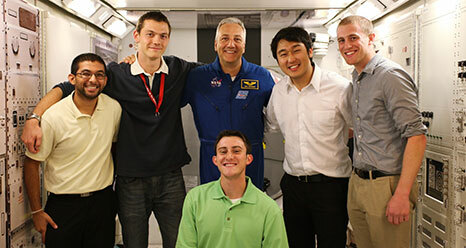 A team of interns from NASA’s Johnson Space Center (pictured below) in Houston created original lyrics, convinced several initially incredulous astronauts to dance along and shot the video at several NASA centers. Then they integrated the whole kit and kaboodle with the “Gangnam Style” instrumental track. Scotty would be proud of the intricate engineering demanded to pull this off – but where are the tribbles ! The video features a fun loving crew of NASA astronauts including Mike Massimino, who deftly repaired the Hubble Space Telescope among other things, Clayton Anderson and Tracy Caldwell Dyson who lived and worked for many months aboard the International Space Station, and Mike Coats, a Shuttle commander and the retiring Director of the Johnson Space Center. The video also features actual footage from the International Space Station , Apollo Moonwalks, Curiosity on Mars, Dawn at Vesta, Houston Mission control, the SLS and Orion Crew vehicle as well as real research labs and scientists here on Earth. “Gangnam Style” by the Korean singing star PSY is the most popular YouTube music ever and is enjoyed by millions more every day since it was released last summer.